Andrea Electronics Corporation (OTCMKTS:ANDR), a company that specializes in designing, developing, and manufacturing hardware and software products for improving speech and communications, plummeted to a 52-week low of $0.04 before staging a sharp reversal and bouncing to a new 52-week high of $0.13 on heavy volume. The stock nearly more than tripled since hitting its intraday low and volume has surpassed 1 million and continues to climb. The share price gained over 48% since prior open. Andrea Electronics Corporation (OTCMKTS:ANDR) also filed its 10-K form with the SEC yesterday which reflects its Full-Year 2015 financial results. The company had a phenomenal year showing that revenues had increase by $12.1 million since 2014. This was the result of revenues recognized for patent licensing agreements that were entered into in 2015. Net income for 2015 surged to $3 million compared to a loss of $3 million in the prior year. Cash balance increased from $3.5 million in 2014 to $5.6 million in 2015 showing the company has plenty of liquidity to continue operations. The company has filed several SEC 8-K forms in the last few months. All were forms stating the company had entered into a definitive agreement. The most recent agreement was for a settlement with Waves Audio LTD. ANDR announced that it had resolved the outstanding litigation between both companies. It seems as though all of the SEC filings were definitive legal resolutions regarding outstanding litigation matters. It is likely that several limit order stop losses were triggered as the stock fell and several investors realized the depressed valuation and bought shares driving up the price. ANDR has called out that dilution is a risk given that most of its financing has been in a dilutive nature from convertible preferred shares. This will likely cause downward pressure on the company if financial institutions choose to convert its shares after this recent run up in the share price. There are three business unit segments: Anti-Noise Products, Patent Monetization, and DSP Microphone and Audio Software Products. Anti-Noise Products include noise cancellation and active noise cancellation computer headset products and related computer peripheral products. Patent Monetization includes Monetization Revenues. Digital Signal Processing (DSP) Microphone and Audio Software Products primarily include products based on the use of some, or all, of the technologies. ANDR is currently trading at an $10 million market valuation. The company has resolved several outstanding litigation matters and saw a significant increase in revenues due to patent monetization. If this trend continues, ANDR gains could be just beginning. There will likely be more updates as ANDR decides how to invest the cash it recently received. 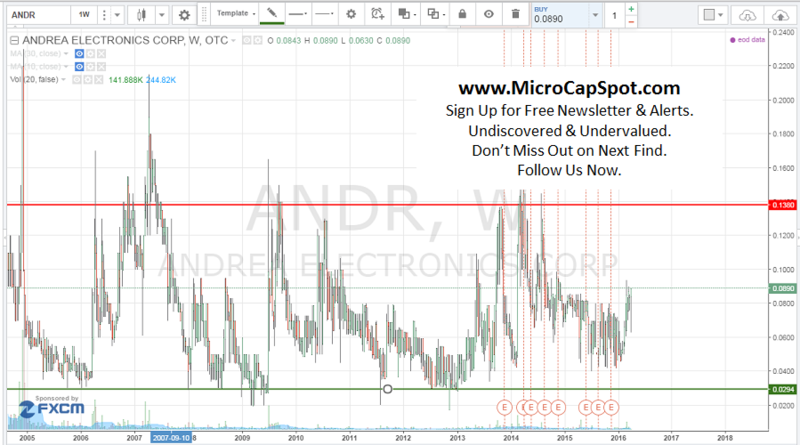 We will be updating on ANDR when more details emerge so make sure you are subscribed to Microcapspot so you know what’s going on with ANDR. Disclosure: we hold no position in ANDR either long or short at the publication of this article.